Anytime we’re going to receive what the Lord would have us receive, He’s always going to bless us. Always. Some people have such a poverty-stricken mindset that they believe, when they get to Heaven, all they’ll get to do is weed-eat. But, God built us a mansion! When we get to Heaven, it will already be built according to all of our tastes before we could even voice them! The colors will are unimaginable because we’ve only ever seen colors as tainted by sin; the colors will be colors of life! Heaven will be more glorious than we can imagine. That’s not the mentality of the Glorious Church. The mentality of the Glorious Church is “we’re well able.” Because of who? Not because of ourselves, but because of Christ that dwells in us! So, we are well able to do all that He has called us to do! There’s teaching out there in the Church world that we should be secretive about what we believe. That’s lying. Our teacher is still the Ancient of Days; His name is Father God; His Son is Jesus Christ and the Powerhouse of Heaven, the Holy Ghost, dwells within us! So, our study is still with the Ancient of Days; the Creator of all there is, and all that in them is! Ever since I was saved at 6, then filled with the Holy Ghost just before I turned 11, the Spirit of God put something in me; it was the call of God! It was the anointing of God to share the message of Christ! When I was very young—before I had sensed the call of God in my own conscience—my Aunt Lilly would point at me as I walked in and say “He’s a little preacher man… He’s going to preach the Word of God”, and when others then asked me, I would always agree. Though I decided—when I got older and moved away from God—that I would be something else, when I got back to the Spirit, I knew what God had originally put in my heart was my true calling. I hadn’t decided to be a bank robber or anything bad—and even though it was a benefit to society—it was not what God had planned for me. What God has planned for us is the best; it’s where the greatest joy is; it’s where greatest peace is; it’s also where the greatest tests and trials are! Why? Because satan wants to get you off course! Because satan knows that if you obey God and fulfill your calling, you’re going to bring others into the Kingdom of God! That’s why God said to “make [the vision] plain upon the tablets”! Even when people are in a hurry, the vision should be plain enough that they always have a clear picture of exactly what the vision is! When some people attend some churches, and others ask, “how was it?” they respond with “I don’t really know… They had lots of lights and other stuff, but I really don’t know.” The way God has always used me is that He has me make it really plain because He’s always kept it really plain with me; that’s the only way I know how to do it. Some may say, “You need to be more politically correct!” No, I don’t! That’s what’s wrong with the church-world today! Many ministers have decided “I’ll be politically correct” because they don’t want to offend anybody; that’s why people are leaving the church right and left! They don’t have any absolutes anymore! Living for Jesus means that you are supposed to be absolutely Christlike! Some may say, “I can’t believe you said that!” Others may say, “You’re saying we have to be perfect!” The word “perfect” in the Word of God should have actually been translated as “mature.” We should mature in Christ! When babies grow up, they make mistakes. Even if we parents tried really hard, we might remember some mistakes we made; and it may help us have compassion on others, at times. It got to the place where I said to my children, “Kids, there were a few years that I ran from God and that was no example!” How do I know? Because I still go back to that town and people come remind me of my past! God doesn’t remind you of your past! People might, but God doesn’t! The Bible says that if you get your sin under the Blood of Christ, He forgets! When you go “fishing in that mud-hole”—bringing up your own past—God responds with “What are you talking about?” He literally erases any memory of your sins from His mind and His Spirit! In fact, the Bible says that our sins are removed as far away from us as the east is from the west! Where does the east start and end? There may be boundaries with the north and south, but there are no boundaries with the east and west! Our sins are infinitely removed from us! So, to what are we “holding fast”? We are holding fast to the greatest outpouring of the Shekinah Glory! What is the Shekinah Glory? It’s God’s brightness of glory! In other words, this glory is going to manifest to such a degree that the whole world is going to know it! You may think, “Well I heard He’s going to come like a ‘thief in the night.’ “ But, did you know He’s not talking to believers! He’s talking to those that are only contemplating getting saved. He’s talking about how it will seem to those that aren’t looking for Him! He said, “I’m coming back for those that are looking for me.” Every time I hear something on the news that lines up with the Word, I look up! The Shekinah Glory of God is the brightness of God, and it will shine so bright the whole world is going to know! The Bible didn’t say the whole world will believe, but they will know. You don’t have to agree with me, but I believe that God is such a good God that pilots who know the Spirit of God and are filled with the Holy Ghost will know as that day approaches they shouldn’t go into work that day. When I was growing up, they showed the planes diving and crashing. But, did you know God is so merciful that even through tribulation the Word says there will be those that stand and they’ll get born again! God loves mankind so much, I don’t believe He’s going to just destroy half of the earth during that time. Some may say, “Well, how can you prove that?” The Word says during tribulation there will be those that cry for the mountains to fall on them, and if it did it won’t kill them! Think about it: they even have an opportunity to stand through tribulation and make it to Heaven. That’s amazing! I’m going on the first bus, though! I’m going in the first round! Haha! He’s not going to have to hold a bus for me because already going to be at the door saying, “Open! Open! Open! Open!” I’m ready! Some may say, “Well, that’s the Old Testament.” I’m glad you know that. He said the latter house will be greater than the former, doesn’t it? Some may yet say, “Well, that only applied then.” No, it doesn’t! Some ministers might claim, “this is my whole ministry.” But Jesus, Peter, John, James, and Paul touched on many subjects, didn’t they? I’m sorry, but I just don’t agree that God calls a minister to only minister on money. Just preaching on money won’t get people saved. It might save their finances, but it won’t save their souls; it won’t get them born again. God does not call ministers to minister on only one area. As a minister, I know what God has put in my spirit: I’ve preached on all areas of living. All of it. Why? We need the whole counsel of God! Now, if you’ve been around my ministry a long time, I always go back to holding fast. Why? It’s a portion God put inside of me! I always go back to the Holy Ghost and fire! I always go back to this move of God we’re in—we’re not going to get into it because we’re in it now—because it’s intensifying and we should be further than we are! Now, don’t get depressed or discouraged! We are to still look up and say, “Lord, forgive me for dragging my feet and going slow.” And God will forgive us and accelerate our growth if we choose to go that way! I don’t know about you, but I choose to go that way! “Not that we are sufficient of ourselves to think any thing as of ourselves; but our sufficiency is of God; Who also hath made us able ministers of the new testament; not of the letter, but of the spirit: for the letter killeth, but the spirit giveth life. But if the ministration of death, written and engraven in stones, was glorious, so that the children of Israel could not stedfastly behold the face of Moses for the glory of his countenance; which glory was to be done away: How shall not the ministration of the spirit be rather glorious? For if the ministration of condemnation be glory, much more doth the ministration of righteousness exceed in glory. For even that which was made glorious had no glory in this respect, by reason of the glory that excelleth. For if that which is done away was glorious, much more that which remaineth is glorious. I highly recommend that you read 2 Corinthians 3 and see what the Lord would say unto you. In everything of God, there are two sides: there’s the side of the dark, which means you’re on the wrong side of judgment; then, there’s the side of the light, which means you’re on the right side of judgement. How often have you gone to the restroom and you wanted to clean your hands but the soap dispenser is empty? Now, I know you are all more peaceful folk than I, but it’s aggravated me before; I really wanted soap. As dispensers of the Lord, we have the world out there that’s gone to the church at times and they got nothing! And we wonder why they didn’t want to come back. Well, they didn’t get anything when they went up to the dispenser! They may have gotten a nice story and a pat on the back, but there was no anointing. They went and if the praise and worship would have been praise and worship, not entertainment, they would have sensed the presence of God. Who’s fault is that? Some would say, “Well, it’s God’s!” No! It’s Man’s! The work of Man is to seek God and worship Him as He wants to be worshiped! Cain wanted to worship God in his own way. Guess what? God did not receive. Abel worshiped God in the manner God desired. Guess what? God received it and honored Abel for it! Cain then killed Abel. Why? Because Cain was set on doing things his own way in rebellion against God. In the church, we have people that say, “Well, bless God, I’m going to do it my way and God can just come down and bless it!” Well, He’s not going to bless it. God’s not going to bless anything only you want to do! The same would say, “Well, the Bible says that the Lord blesses all I put my hand to!” If you go put your hand to a .45 caliber handgun and rob a bank, I promise you God is not going to bless it! He’s not going to work with you and say, “Now’s the right time.” He’s not going to work with you! God will only put His hands to your hands and bless you when you put your hands to His work and His will! Now, listen with the spirit. Lord, I pray that there are ears to hear and minds open to hearing what You desire to say to us! Because we are in for the greatest display of the glory of God that will reap the greatest harvest of mankind! God timed it. God knows it! And God’s looking for a people that will hold fast for it! That’s us! Hahaha! That’s us! I’m not going to say, “Oh, God, give it to another generation.” No, bless God, I’m going to be faithful! I’ll be faithful to the Heavenly vision! I’ll not be disobedient to it! Sounds like the latter house shall be greater than the former, doesn’t it? I’m not trying to put words in here. I’m just showing you that these scriptures complement what Haggai 2:9 said because Haggai 2:9 said there’s a set time! There are a lot of Christians that say, “Well, now there’s a lot of pressure on the church and now the church is going to fall apart!” God never intended pressure to ever put us on our knees! God said “come freely to the throne of Grace!” He intended for us to get so full of the Word and so full of Jesus that we welcome the time to fall to our knees before God and plead the case of humanity! Go back to Acts 1 & 2 and you’ll see that God told the church that it was not birthed until Jesus had died, was buried, and resurrected and seated at the right hand of God! At that moment, the church was birthed! The Church of the Spirit! Hahaha! That’s us! The glory of the latter house will far exceed that of the former house because the spirit of Christ seated at the right hand of God lives in us! The Word says we are seated in Christ at the right hand of God! What we have to realize is this ministration was never going to be an exit for this church. When the children of Israel left Egypt it was a type and shadow of the church leaving the world system! It was a type of the rapture! If it had been some in the church today, they would have said, “No, I’m believing God. Leave me alone.” Well, you dummy! You just passed up the hand of God! When the heathen wants to run and throw it on you, just receive it in the name of the Lord! They got mad at Mary (a prostitute before she came to Jesus). She poured out her expensive, scented oil, washed Christ’s feet with tears, and anointed His head with oil! That fragrance was worth a lot of money. When you come to Jesus, you’re washed white as snow! Whatever’s in your past is gone. Glory to God! Hahaha! My past—my ignorant days—are under the Blood of Christ, and God doesn’t see it anymore! You know how I started answering him? “No. No, it’s under the Blood. Why should I remember it? God doesn’t, and He’s the only one that would have a right to hold it against us!” But in the steppes of humanity’s sin, Jesus went to the cross so that we could be born again! He doesn’t hold anything against us, glory to God! So quit holding it against yourselves! Just repent. Shake it off! The ministration of old—the Commandments given Moses by God—was so glorious that it lit his face as he came down off the mountain! Some may say, “Well, why doesn’t that work for me?” Because you don’t believe it! You’re still wallowing around in your past life. You’ve never really embraced that Christ translated you out of the kingdom of darkness into the Kingdom of Light! The greater that revelation of the light gets in your heart, it is allowed to radiate from your body! Everything we get from God goes into our spirits. Even the healing of God, the full measure of everything God has for you, goes into your spirit. When out of your spirit words of faith begin to sound, it activates every spiritual deposit of the Living God! Confession is made unto salvation! Even though it is all promised you, it is not yours until you begin to confess it! Some people say, “I can’t confess it until I know it’s real!” They’re saying God’s a liar because they are checking their feelings rather than God’s promises; faith has nothing to do with your feelings! We didn’t feel saved when we were walking down there. But, oh, when we got down there and our hearts hooked up with our mouths—or our mouths hooked up with our hearts—and we made Jesus Lord, we walked away with a different cry! They were tears of joy! Why? Because we knew, “I’m in! Hahaha! I’m not going to hell anymore!” That’s enough to get excited about! If you want to keep that excitement, you have to then find out who you are in Christ. We do not cover our faces with a veil. We let God’s glory shine! When we get our mouths lined up with professing, confessing, and speaking who we are in Christ, we activate that God’s glory that resides within us and it radiates forth! If you always walk around saying, “I’m not worth much” and “I can’t do anything”, you aren’t worth much and you can’t do anything! I’m not being mean. You set the destiny of your life with your words! Have you ever gotten excited about going to church and before you got to church you lost your excitement? It’s because the devil jacks with your feelings. I always blamed it on my kids. But, no, that’s not it. I let go of it! There is only liberty where the Spirit of the Lord is, and the Spirit of the Lord only inhabits faith! Some may say, “Well, that’s the house of God. It’s that building there.” No, He doesn’t. He does not live in this building. The only reason the presence of God is in here is because He came with you, and He came with me. We should honor the house of God because that is the place where we receive His instructions. But, God does not live in a house. All we need is a place to join together to worship God and His presence will be there! We need a place where we humbly and reverently draw nigh unto our Most High God and fearfully seek His face! We come to hear what Jesus said in John 6:63: the words of spirit and the words of life! When we honor God’s Word and our purpose for coming together, we receive those words of spirit and words of life into our spirit and mature into the carriers of the glory! We mature into dispensers of God’s glory! When people come and need something from God, they can come to you and you will put God into them! You will put life into them! Instead of attacking them, saying, “You idiot! You’re going to hell for the way you’re living!” you will remember we were all there, yet God had mercy on us. We will not wear a veil! Remember when we were kids and we would sing “This Little Light of Mine I’m gonna let it shine! Hide it under a bushel? No! I’m gonna let it shine”? This glory is what that song is about. We are not to hide! What happens then? That light that lives within you begins to activate because your words of faith are declaring it! That light begins to radiate out of your spirit and it begins to affect your mortal body! That’s your opportunity! Some may say, “Well, I don’t have a platform.” God will give you a platform if you will seek Him on your knees and give Him a platform! The church is going to fill up not because it’s pastors or preachers winning the harvest alone. It will be done by the Body of Christ energized and set on fire by the living glory of God. His Shekinah Glory shines so brightly! Why? We’re all members of a body. We’re all members of the same body! And, as that glory increases in me, it will cause it to increase in you! And, as it increases in you, it will cause it to increase in me! Some may say, “Yeah, but I’m just a little toe on the Body of Christ.” That little toe is connected all the way up to the neck! That’s why the Word says we should gather together even more when we see the day of Christ’s return approaching! Right now, there’s a move in the church that says, “We’re only going to have a Sunday morning service”, “We’re going to have a thirty minute service” and “We’re going to blow in and ham it up right, then go on and do our own thing the rest of the day.” That’s contrary to the Word of God. The Word of God teaches that we gather together even more! Why? So that our supply is restored! Have you ever gone to church feeling a little down and when you left you say, “Whoa, that sure was good this morning”? You might not have even shouted. But you walked out refilled and revitalized because you plugged into the supply of the Body of Christ! The energized Body of Christ is another witness to the Shekinah Glory of God. Doesn’t that line up with Haggai 2:9? I want anyone that hears or reads this message to know because it is spoken and written plainly for all to hear and read! We are holding fast to the completion of everything God has declared to the Glorious Church! As pastor of Living Word Fellowship, that’s where I’m going. I’m not missing it! And, I’m inviting you to go with me! Does that mean that I know it all? No. But, I know the one that does. Hahaha! I have my ear tuned toward Heaven listening to Him! Some ministers may ask, “What are you preaching on?” and I tell them; then, they look at me with an expression of “Why?” Because God said! Did you know that was against the tenets of the religious circle in that day? When they got through running their mouths, I believe Zacharias said, “That’s my boy!” Hahahahaha! I guarantee you Zacharias kept his mouth lined up with God after John the Baptist was born. Zacharias knew fully well what the Lord could do if he didn’t keep his words lined up with God’s; God could shut his mouth indefinitely! How many of us want to get a good report? How did they get that good report? Through faith. In Heaven, you don’t get a good report card except through faith! I certainly don’t want to get there and see all zeros or F’s. I want a good report. What promise was he talking about in verse 39? What we received: Jesus dwelling on the inside; us living as brand new spirit beings. Abel, Enoch, Noah, Abraham, Isaac, Jacob, Sarah, Joseph, Moses and Rahab were all in Heaven and, yet, God provided a better promise for us! They all held fast despite terrible trials and tribulations to their portion of God’s promise, even though they hadn’t received it. Glory to God, we are the generation to see God’s promise of the catching away of the Bride that has adorned herself! Glory to God, that’s what we’re to hold fast to! When you hear the news of things going on in the world, we ought to be getting happy for our redemption draweth nigh! The fulfillment of all that God has said to the church is coming on our church and on us because we are holding fast to everything God promised us! What David declared happened exactly as he said. What are we saying? What are we saying? I’m in and swimming to the deep end of all God has for us, His glorious church! Remember when Jesus asked, “When I return, will I find faith?” What is Jesus going to find coming out of our mouths? Out of your mouth? Will you be hiding in the mountains waiting for Jesus to come? Well, I’ll tell you I’m not hiding with you! I’d rather go out and let the armies of the anti-Christ shoot me. Glory to God! I believe it, Lord! There’s no faith in that! I like what I heard a preacher say: the Spirit of Faith will make a tadpole slap a whale. Picture that. Even if it were a giant tadpole. Even if it were a foot long. He’s swimming out there, and here comes a whale. A big whale. A blue whale. The whale says to the tadpole, “You ain’t nothin’. Look at me!” And, with the Spirit of Faith, the tadpole hits that whale with his tail and sends the whales head spinning! The devil is used to Christians cowering down and trying to figure our way out. But, we should then just bow up and slap him again! Hahaha! It’s not your hand that slaps the devil. It’s faith-filled words that slap the devil back under your feet! There’s nothing in the natural we can do! Why? Because our weapon is the Word of God! It’s a two-edged sword, and you can use it to slap the devil around. And, then, you’ll hear that fine ring that comes from only the finest steel as it slaps the devil back down. People ought to hear the ring of that fine steel as the pass by your house because you’re continually slapping the devil. You’re slapping him in your life. You’re slapping him in your kids’ lives. You’re holding fast to what God has declared unto you and what He’s promised you. God said, “Hath I not said it? Shall I not do it?” We have to get a hold on that in these last days! I believe I hold fast that my God is not a man that He should lie! Everything He has promised, He is surely bringing it to pass in my life, in my church, in my city and in my family! Everything that belongs to me through the Blood of Christ mine! And it’s going to all be manifest in my crown! Did you know the devil likes to get you in a knot? Because when he can get you in a knot, you’re not in faith. The Word says that when you enter into faith, you enter into rest. You may pray as you’re walking or doing other things, but the countenance of faith is not “Ooooooooh, Looooord!” That’s not faith! Why? Because you have peace. You are in faith. God wants more than just us in the church, now. I believe—I said it years ago, and I’m still convinced of it—years ago, they started building these giant arenas for sports. You know what God told me they were really built for? For places to gather the harvest. And there won’t be any beer sales! There won’t be any popcorn and sodas brought into the services. Why? Because they will gather together for one reason: to know about this Jesus; to know why the church is so powerful and full of glory. Some worry and ask, “How are we going to get the lost?” I have friends that ask this. How do we get the lost? Press into what’s ours. If you start shining, they’ll start climbing. If you start shining with the glory, they’ll start running to the church; they’ll run to find out what you have. Right now, there are many Christians with big talk but no game. What the world has seen is a church that looks like a chihuahua with a mouth like a mastiff. When the world finally peaks behind the door, that weak chihuahua can’t even lift its head off the floor and barks uselessly. God’s wanting to make us look like the Son of the Living God. God desires to make us look like the Fourth Man in the fiery furnace. The former rain was to plant. The latter rain was to bring in the harvest. God is giving to us the former and the latter rain in the same season! The reapers will overtake the sowers in this very season! We are going to see meetings—because we’ve held fast to His Word and His Truth, unwavering as others go to and fro—in which there will be flashes of light during praise and worship, before the minister ever speaks! When the light settles, there will be sinners in the alters prayed through and baptized in the Holy Ghost who will then turn around and go after the harvest themselves! That’s the seed planted, and that the seed matured! For what are you believing? I’m having it all. It won’t be the white flag of surrender that we’re waving; it will be signaling where we are for our glorious reunion with Christ! We have made a place for you to manifest your glory! We have made a place by our faith and the declaration of our mouth where we are going to have it all! Some may hear or read this and think, “He’s lost his mind!” I sure did! I got the mind of Christ! Hahaha! Some people say, “I just want to make Heaven!” I never live my life that way. I don’t want to just barely get by. Some ask, “Well, do you have billions in the bank?” No, but I have a full supply. Some people look and say, “Aw, you don’t have much.” But, let me tell you what I have: I have the Zóé Life of God living on the inside of me. It made me a brand new creature and species in God. I have God the Father, God the Son and God the Holy Ghost dwelling in me. I have at least one guardian angel that goes with me at all times. There may be more because of my assignment, it’s not up to me. Either way, I know I have more than enough! He’s not only my shield, but He has my back! He’s my everything! He’s my breath! He’s everything that I have need of! He said, “My name is I Am.” Hahaha! We need to start getting happy when you realize “I Am” is in us! Who am I? “I Am.” Hahahaha! We’ve won, glory be to God! Some may say, “Well I can’t say that. 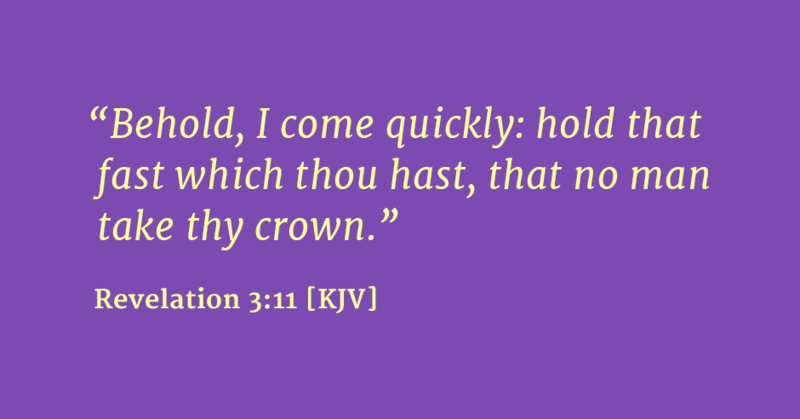 I don’t feel like it.” Remember that the Lord said to hold fast to our crowns. The Lord said that every generation will have a crown. In the military, each award or promotion comes with medals or insignia. In the Kingdom of Heaven, our crowns will have in them a jewel that represents our having held fast to the greatest move of God that’s ever been witnessed by mankind; that’s part of our crowns, and I’m not letting anyone steal my crown. I’m not letting anyone steal my crown. Note: I copied some of the things my father said word-for-word while I wrote other things as I was ministered to by the Lord.